Built by Alejandro Christophersen, this gargantuan granite temple has housed the remains of the Alvear family over three generations. Its size adequately reflects the importance of this family. A nearby avenue named after them is synonymous for upper class elegance with expensive design shops, a few embassies, & the Jockey Club all sharing the same address. The general referred to on the cornice was Carlos María de Alvear, a controversial fighter for Argentine independence & frequently at odds with founding father José de San Martín. With a life worthy of being made into an epic movie, Carlos acquired the status of national hero for winning campaigns during the 1827 Argentina-Brazil War. He died in Washington, DC in 1852 while serving Argentina’s first ambassador to the United States. 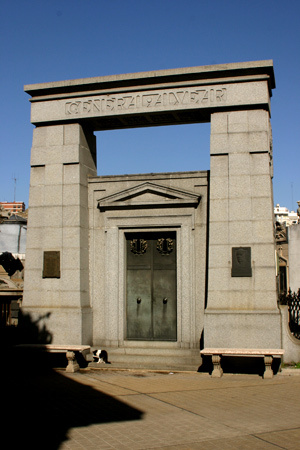 One of Carlos’s most important sons was Torcuato de Alvear, also buried in the family mausoleum. 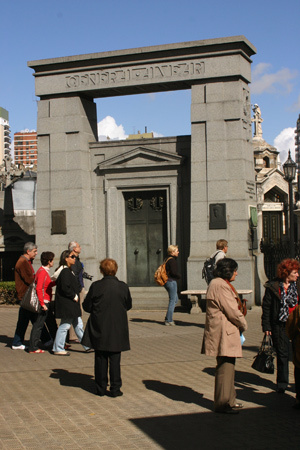 As the first mayor of Buenos Aires after it became the nation’s capital, Torcuato instituted wide-sweeping improvements: constructing Avenida de Mayo down the middle of a city block, demolishing the old marketplace in the main square, & commissioning the large entrance gate for Recoleta Cemetery. Since Torcuato ordered cemetery improvements, he made sure to place his family’s mausoleum in front. One of Torcuato’s sons became President in 1922. Marcelo T. de Alvear is remembered for leading a period of economic & cultural prosperity. Although part of the upper class, Marcelo became instrumental in shaping the Socialist-leaning Unión Cívica Radical party. ¿Sabés si Regina, la mujer de Marcelo T., se encuentra en esta bóveda? Porque fue firmemente rechazada por los Alvear ya que ella era una cantante lírica. La historia de Regina y Marcelo T. (a quien le debemos lo “afrancesado” de Buenos Aires cuando él fue intendente) es más que interesante, si te interesa agregarla me avisás. Gracias, Paula. Sabemos la historia de Regina pero elegimos no incluirla para no hacer el post demasiado largo. Son miles de historias que se puede contar y nos resulta difícil decidir cuales poner aca y las que no :) Saludos!